The importance of social onboarding and the value of connecting new hires with their coworkers has been researched and written about by many organizations, from SHRM to Google. Helping teams build strong relationships has always been a goal of ours at Donut, so we wanted to make it super easy for companies to facilitate connections for new hires as well. Donut can automatically introduce your new hires to a different lunch buddy over their first few days and weeks. For example, at some companies Donut introduces each new hire to a different lunch buddy on their 3rd, 4th, and 5th days. At others Donut sets them up for lunch once a week for their first 4 weeks. Most companies create a Slack channel (like #lunch-buddy-volunteers) for existing employees to join if they want to volunteer to get lunch with a new hire. Donut then introduces each new hire to someone random from that channel. This also helps new hires get to know people from other teams and areas of the company as well! Want to add new hire lunches to your Donut onboarding Template? Here's how! 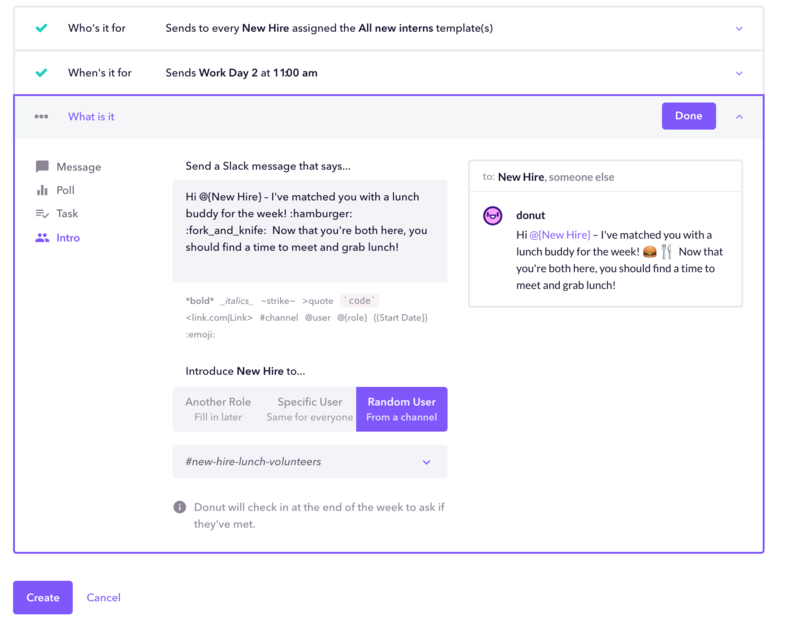 Create a new Slack channel (like #lunch-buddy-volunteers) and invite existing employees to join the channel if they want to volunteer for new-hire lunches. From the "Onboarding Templates" tab on donut.ai, select the Template you'd like to add lunch intros to (e.g. if you have a "General Onboarding" or "All New Hires" Template, you can add it to that so that all new hires will automatically get these intros!). Then click "Add Message" on the day you'd like the new hire to get their first lunch buddy intro. Hit "Create Message" and you're all set! STEP 3: Repeat as needed! Repeat Step 2 to add more lunch buddy intros to your onboarding Template. For example, if you want each new hire to get a different lunch buddy on their 3rd, 4th, and 5th day, you can just repeat Step 2 and click "Add Message" to schedule an intro to someone new on each day. You're all set — any new hires with the Template you selected will get connected with lunch buddies on the schedule you set.